This is no early April Fool’s Day joke, this Ink Fridays™ deal is one that’s quite a steal for everyone. Our money-saving Ink Fridays™ deal this week is: Buy 1, Get 2 Free Dell Replacement (Series 21) Combo Pack of Black ( Y498D) & Color (Y499D) Cartridges. This means you can take home 6 printer cartridges for only $2.49 each at a special low price of $14.98 instead of a retail price of $113.94. That’s over 86% in savings! As always, we’re happy to share this Ink Fridays™ deal with our amazing shoppers exclusively this Friday, March 27th. Don't forget to snag this better than BOGO deal before it ends on Friday, March 27th at midnight PST! We understand choosing the right printer cartridges for your printer model is key before making a purchase. For that reason, here's the two Dell printers that are compatible for this week's special printer cartridge discount. You may also visit this page to find those compatible printer models. We share these Ink Fridays™ deals every week here on our blog, but if you want a friendly reminder, you are more than welcome to head over here and sign up for our Ink Fridays™ mailing list. If you're new to Ink Fridays™, these deals change every week and might be anywhere from printer cartridges to photo paper as this week's deal is. Ink Fridays™ was started after hearing feedback from you our customers, and we decided to create this special weekly deal as a way to show we are here, and we are listening. Let us know what you think we should include as a future Ink Fridays™ deal in the comments below! 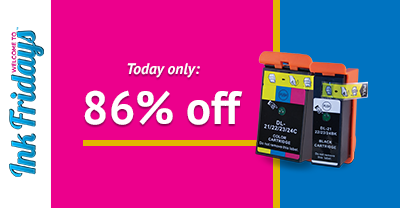 Finally, don't forget to check out this week's deal before it ends on midnight for our 3 sets of Dell Series 21 printer cartridges at only $14.98!